In March 2018, America hailed the “March for Our Lives” and the National School Walkout for the incredibly innovative idea of enlisting children to change America’s gun laws. It was a groundbreaking plan dreamed up by a group of socially conscious kids who just happened to be white. But like the Kardashians’ plastic surgeons and Taylor Swift’s cover of “September,” the Parkland, Fla., students were simply appropriating something black people did decades ago. From May 2 through May 6, 1963, long before students walked out of schools across America to protest American laws that enabled the indiscriminate killing of innocent children, thousands of kids walked out of school to protest American laws that enabled the indiscriminate killing of innocent children. On Saturday, thousands of children gathered in Birmingham, Ala., to re-create the Children’s Crusade of 1963. Sponsored by Jack and Jill of America and the Children’s Defense Fund, the march through historic downtown Birmingham featured at least 35 of the original marchers, Martin Luther King III and Birmingham Mayor Randall Woodfin. 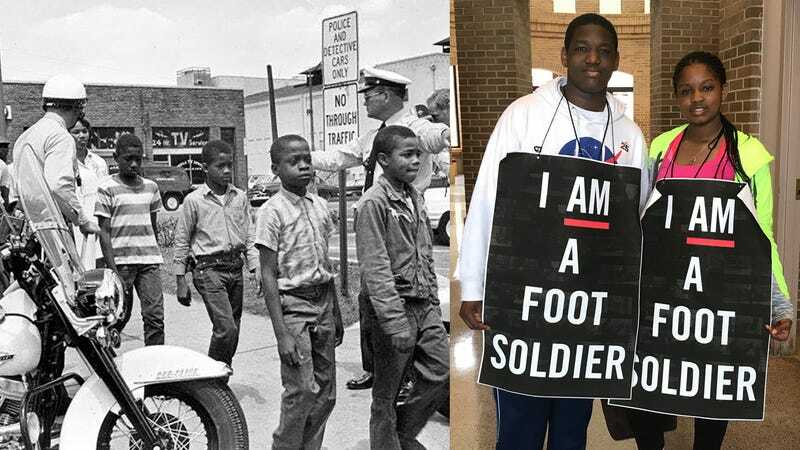 This Children’s Crusade is a new chance to remember, honor and follow the example of the children who were the frontline soldiers and transforming catalysts in America’s greatest moral movement of the 20th century—the movement for civil rights and equal justice. We owe those extraordinary children and youths a debt of responsibility and gratitude. It will also remind today’s children that they are not just citizens in waiting, but at this critical national time they have their own stake in freedom and justice and they too can be transforming agents for change. I’m so happy to see this new Children’s Crusade to end the violence of guns and poverty by nonviolent means. It’s way past time to protect children and not guns. Most people know about the September 1963 bombing of the 16th Street Baptist Church in Birmingham. But the blast that killed Addie Mae Collins, Cynthia Wesley, Carole Robertson and Carol Denise McNair is simply the most well-known in the campaign of racial terrorism against people working to desegregate the city. Some of the original foot soldiers who participated in the 1963 campaign gathered for a premarch breakfast at the Birmingham Civil Rights Institute, telling stories of how they were attacked by dogs, sprayed by water hoses and jailed for their participation in the protests. On May 2, 1963, children left school and met at 16th Street Baptist Church to began a three-day campaign to protest racial injustice. Organizers of the original march hoped that Americans witnessing the racial terror would rethink their positions on the demonstrations by African Americans seeking racial justice and inequality. After the country watched forces commanded by Public Safety Commissioner Bull Connor jail more than 1,000 kids, protesters assumed that their fellow countrymen would be more sympathetic to their cause. Birmingham jails became so overcrowded during the campaign that law enforcement officers hoarded the children into a makeshift internment camp at the city’s fairgrounds, so of course, America would change its mind about this unique form of racial terrorism, right? Upon hearing about the march, Kanye West did not say that the original children’s marchers were his heroes, as he did with Emma González.